Homepage photo: Participants in ICT Hub Belgrade. “Two years ago, I started developing an application for schools in Pristina, and today I am looking for a partner in Belgrade to apply it here. I did not believe that that was possible, “says for Radio Free Europe Egzon Kelmendi, a young entrepreneur from Kosovo. Kelmendi in Prishtina works in a start-up firm that has devised a digital classroom for schools and universities. 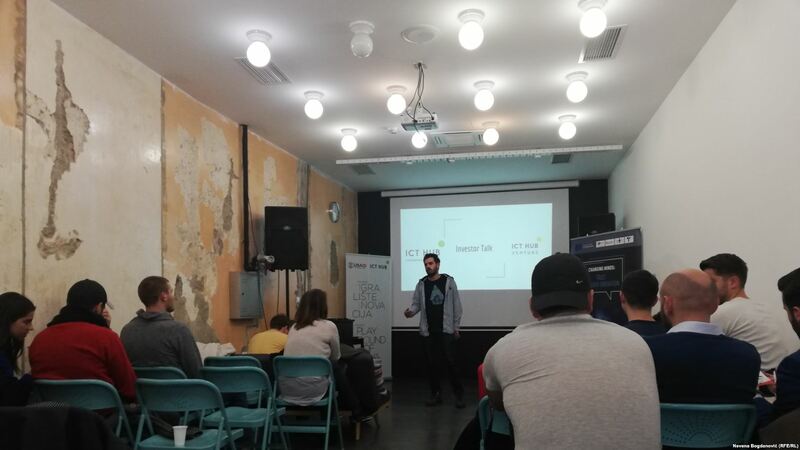 This weekend he came to Belgrade for the first time, on a two-day workshop for start-up entrepreneurs. The workshop is being implemented in the framework of the three-year project “Changing Minds: Trust through Innovation”, which was supported by the European Union, aimed at bringing together experts from Serbia and Kosovo. All this comes at a moment when the dialogue between the two sides is in deadlock, and Belgrade and Pristina are in a trade dispute since Kosovo raised customs duties to 100 percent for products from Serbia and Bosnia and Herzegovina. “Our goal is to see whether cooperation is possible, and so far, we have shown, in every activity we have organized, that our problems are the same, and that we can solve these problems together”, says Lidija Radulović from the Belgrade Fund for Political excellence, a non-governmental organization that conducts project together with its partners. Representatives of five start-up firms from Kosovo met in Belgrade with start-up entrepreneurs in Serbia to find together sustainable ways of doing business and entering the global market with a common goal. In addition to same goals, they share the same problem – it is difficult to find investors. Egzon Kelmendi presents his idea. Photo: Nevena Bogdanović RSE 2018. Aleksandar Markovic, director of Application Arts from Belgrade, who is developing an app for booking catering facilities, says that support is poor. “It’s not great at all. State and private funds are lacking. These investments that some funds offer are so small that people can not even work, to develop the product properly. Your money does not cover any rental and salary costs, let alone the placement of products, “Markovic says. Živojin Sekulić from 3D Software Solutions, who develops face recognition technology for various industries, believes that in the last few years the situation in Belgrade has improved. “Some state funds have emerged, and there are also standard “venture capitalists” (investors who in turn seek a share in the company) that existed before. There are many new “business angels” (the investors in the initial phase of the project), we have received support from one of them”, says Sekulic, but emphasizes that further investment is needed for further development. “We have negotiated with Serbian companies, but we are still trying to find investors in the markets that are interesting to us – America, Asia and Western Europe, from automotive industry to banking,” concludes Sekulic. For Etrit Tahiri from Zombie Soup, which has been developing applications since 2012, the main problem for launching a start-up company in Kosovo is the finding of workers, as demand for IT specialists is high. “For start-up companies in Kosovo main competitors are foreign companies. These developers are offering higher-than-average salaries in relation to the Kosovo standard, but they are on the winning side, because they would have to pay more in their home countries, “explains Tahiri. Tahiri believes that the advantage of Kosovo is that the market is small, so it’s easy to make contacts. “Since recently we have a ministry of innovations. In their fund, you can get support for running a business, and I think this, unlike with some of the previous state funds, really works, “says Tahiri. That the system does not exactly work are Egzon Kelmendi’s thoughts. “The development of my application requires cooperation with the university, the ministries. That’s why I have a problem. The system is burdened with bureaucracy, but also corruption “, points out Kelmendi. Kelmendi also believes that starting-ups for entrepreneurs in Kosovo are difficult to enter the market. “If there are state and private investment funds, the funds are mostly given to people who have acquaintances. Also, businessmen look for concrete results immediately, and you are at the beginning and have only an idea. It’s not easy to find money, “Kelmendi says. For residents of north Kosovo, start-up funds in Pristina are not easily accessible, claims Milan Milosavljevic from Leposavic. He came to the workshop to learn how to start a business, but also to see the chances of finding an investment fund in Belgrade. He says that his colleagues in northern Kosovo find it hard to find investors from Serbia. “There is no security in the north of Kosovo and then no one will invest in you. If you get the money, the main problem is – what’s next. It’s a volatile area and we are not sure where we will be in five years, and not our business. The lack of normalization of the relationship is going to harm us, and many jobs have failed due to that, “Milosavljevic points out, adding that he is ready to cooperate with both the Serbs and the Albanians. The young generation has the potential to restore these destroyed bridges, Arta Ahmetaj from the Innovation Center Kosovo agrees. She says she has received a lot of useful ideas in Belgrade, which could be applied to her workplace in Prishtina, such as the way business incubators are organized. The incubators we visited in Belgrade provide support to entrepreneurs and for more than two years, if necessary. When I return to Kosovo, I will talk to my bosses so that we can apply it as well. The three-year project of cooperation between experts from Serbia and Kosovo, launched last year, already gives first results. After the 2017 meeting, young developers, designers and activists are now developing four Android and Web applications. Among them are the travel guide through Belgrade dedicated to the younger generation of people in Kosovo and applications with the collection of oral history of common memories in the former Yugoslavia. Take a look inside Women Leadership Academy! How to become a "green millionaire"?